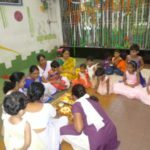 On the occasion of the 72nd Independence day of India the children were dressed traditionally in white. 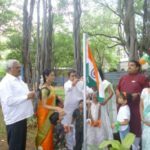 Our National Flag was hoisted by Mr. Mahesh Karpe. 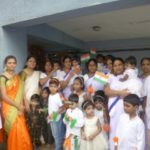 Children participated in flag hoisting and sang the National Anthem with all other participants. Independence Day is annually celebrated on 15 August, as a national holiday in India commemorating the nation’s independence from the United Kingdom on 15 August 1947, the UK Parliament passed the Indian Independence Act 1947 transferring legislative sovereignty to the Indian Constituent Assembly. India attained independence following the Independence Movement noted for largely non-violent resistance and civil disobedience led by the Indian National Congress (INC). The holiday is observed throughout India with flag-hoisting ceremonies, parades and cultural events. The month of Shravan is full of festivals and Nag Panchami is the first . 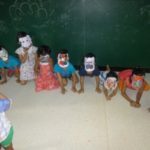 The children were happy to make a cobra idol out of clay and worship it. 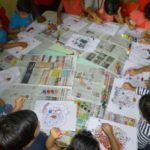 The importance of all the elements in the nature was explained to the children. Naga Panchami is a traditional worship of snakes or serpents observed throughout India. The worship is offered on the fifth day of bright half of Lunar month of Shravana (July/August), according to the Hindu calendar. The abode of snakes is believed to be patala loka, (the seven realms of the universe located below the earth) and lowest of them is also called Naga-loka, the region of the Nagas, as part of the creation force and their blessings are sought for the welfare of the family. Serpent deity made of silver, stone or wood or the painting of snakes on the wall are given a bath with milk and then revered. 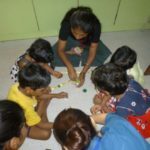 Children from the Shreevatsa tied rakhis to each other to celebrate the joyous occasion of Rakshabandhan. 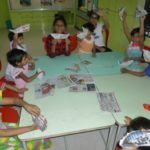 The rakhis too were made with the help of the volunteers at Shreevatsa. 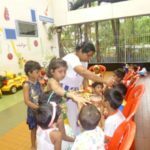 The children also enjoyed the Paneer, pulao and gulab jamun specially made for this occasion. 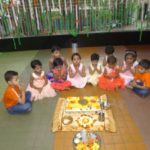 Raksha Bandhan is observed on the last day of the Hindu lunar calendar month of Shraavana, which typically falls in August. 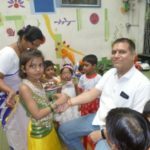 The expression “Raksha Bandhan,” Sanskrit, literally, “the bond of protection, obligation, or care,” is now principally applied to this ritual. 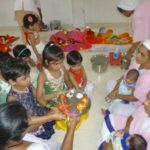 On this day, sisters of all ages tie a talisman, or amulet, called the rakhi, around the wrists of their brothers, symbolically protecting them, receiving a gift in return, and traditionally investing the brothers with a share of the responsibility of their potential care.